Lone Star Racing team principal and driver Dan Knox will debut the new No. 80 ACS Manufacturing Mercedes-AMG GT3 with co-driver Mike Skeen in the team’s home-race next month at Circuit of The Americas (COTA). 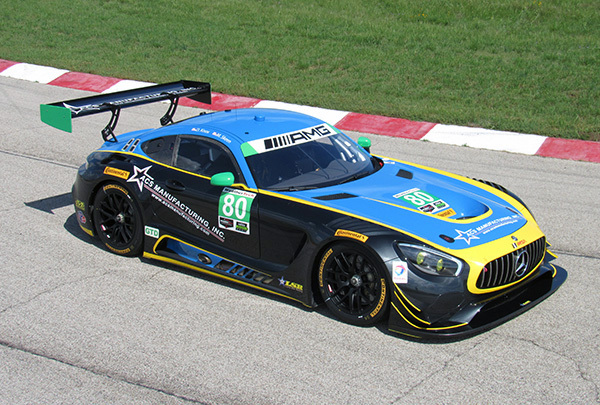 The IMSA WeatherTech Championship Advance Auto Parts Sportscar Showdown at COTA, May 4 – 6, will be the first of four IMSA GT Daytona (GTD) races that Lone Star Racing, Knox and Skeen will contest this year in the team’s new Mercedes-AMG GT3. In addition to COTA, Lone Star Racing will also race in the three-race stretch of IMSA events at Road America, August 3 – 6, VIRginia International Raceway, August 25 – 27, and Laguna Seca, September 22 – 24. Lone Star’s 2017 schedule includes the same four races that the team selected last year for its IMSA GTD racing schedule. Skeen partnered Knox at all four IMSA races in 2016 and the duo also co-drove in the Pirelli World Challenge GT and Sprint-X events at Laguna Seca. Lone Star, which is based in the greater Dallas-Fort Worth area, took delivery of its new Mercedes-AMG GT3 very late last year. The team has thoroughly prepared the new car over the last few months at the team’s Motorsports Ranch-based shop in Cresson, Texas and recently completed its first test at COTA. The two-day session last week at COTA allowed the team to test with the on-site support of Mercedes-AMG Motorsport Customer Racing Engineers. Knox, Skeen and Lone Star earned an IMSA season-best finish of eighth last year at COTA. They were as high as fifth in the late stages of the race only to be forced to serve a penalty for an earlier contact incident in the final minutes. Lone Star raced a Dodge Viper GT3-R the last three seasons, a big-bore, front-engine race car similar to the basic platform of the Mercedes-AMG GT3. Skeen also sees the long-run consistency and potential of the Mercedes-AMG GT3. - Lone Star’s participation at COTA and the other three races will give Mercedes-AMG a fourth entry in those events in its bid for the IMSA WeatherTech GTD Manufacturers Championship in its first year in the series. Victories in the last two series races and a third-place finish in the season-opening Rolex 24 At Daytona have given Mercedes-AMG an early-season lead in the GTD manufacturer title race over Porsche, 100 – 91. “We can’t help but be encouraged by the performance of the Mercedes-AMG GT3 so far this year,” Petersen said.